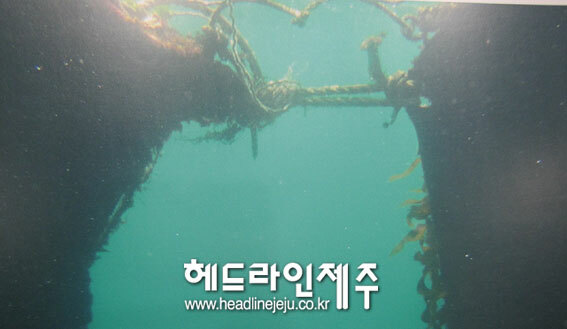 “‘It appeared that the sea area of the Beomseom (Tiger Island) designated as the government natural memorial is largely being threatened as big amount of mud water was leaked from the Jeju naval base construction site into the sea, for the strong rain and wind last weekend. 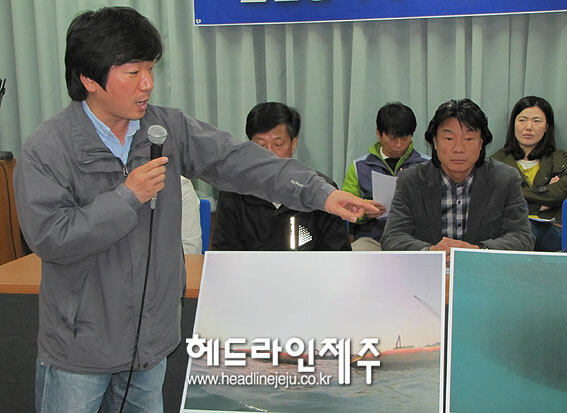 Despite that, the navy has been enforcing construction therefore the Jeju Pan-Island Committee for the Stop of Military Base and for the Realization of Peace Island (Pan-Island committee afterward) made a press conference in the morning of April 12 and demanded stop of naval base construction(destruction) and joint investigation on the affect on the ecology system, as well. 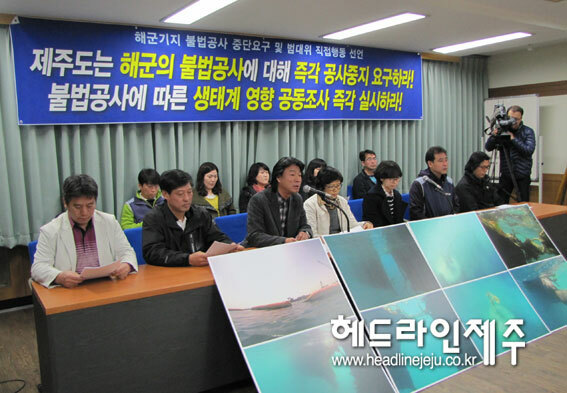 The Pan Island committee’s press conference in the Island People’s Room of the Jeju Provincial Council on April 12. 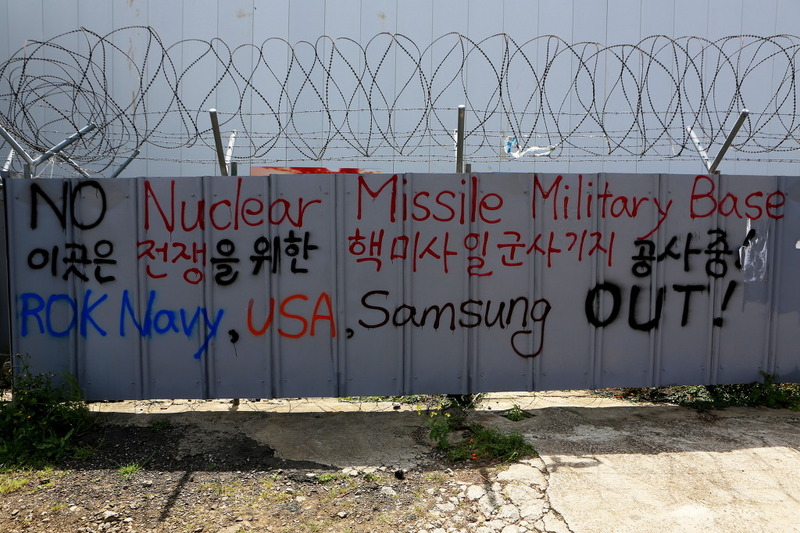 The banner reads, “The Jeju Island government should promptly demand stop on the navy’s illegal construction! Even though it is righteous that there should be protection layers installed to prevent sea weeds onto canvases and should be works to remove those there, various sea weeds have already been propagating on the canvases. The committee criticized both the CHAK and navy and demanded the Island government to take prompt measures on those problems. The navy has intentionally delayed or refused visits even by the government officers who were to confirm the violations of laws inside the construction area. 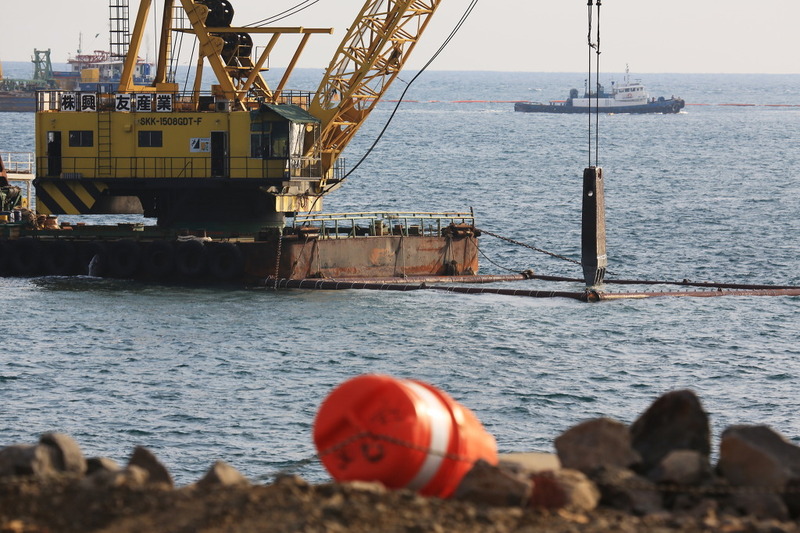 The committee, criticizing the Island government’s clear dereliction of its duty, demanded it to make a prompt order on the stop of navy’s illegal construction (destruction) and to take strong administrative measures on it. 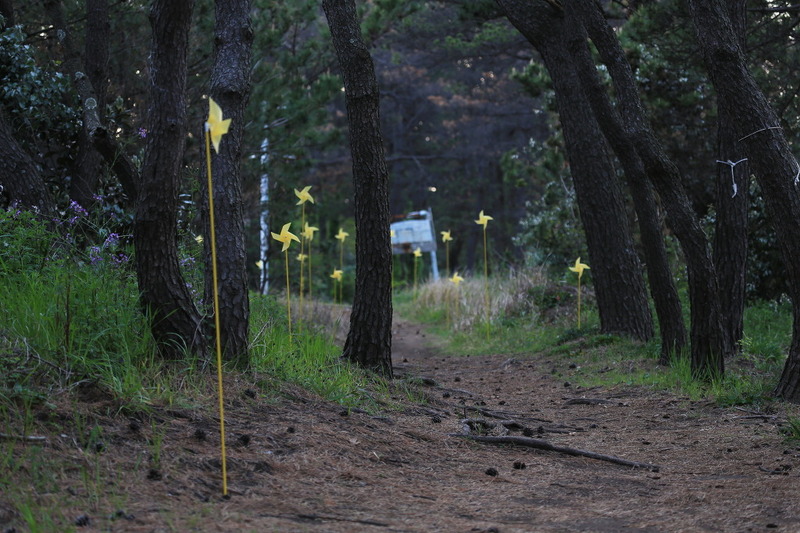 The committee also emphasized that there should be a joint investigation on the affect on the ecology system and independent post-EIA (Environmental Impact Assessment), joined by Gangjeong villagers and environment groups. 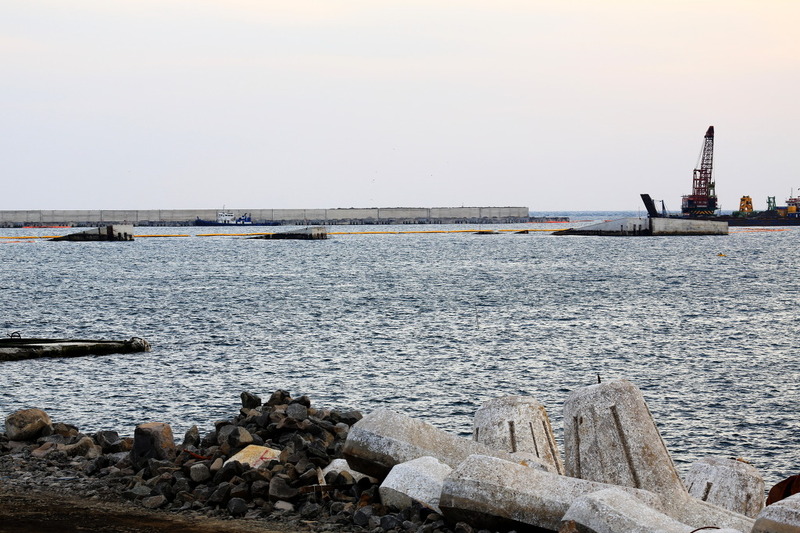 It also claimed that there should be joint examination on the items of performance on the approval conditions within the naval base construction area. It should be noted that people have been demanding such things numerous times, pointing out the problems of illegal construction on the sea (for example, see here). The navy has always ignored people’s demands while the Island government has been irresponsible to take clear and strong measures on the navy. 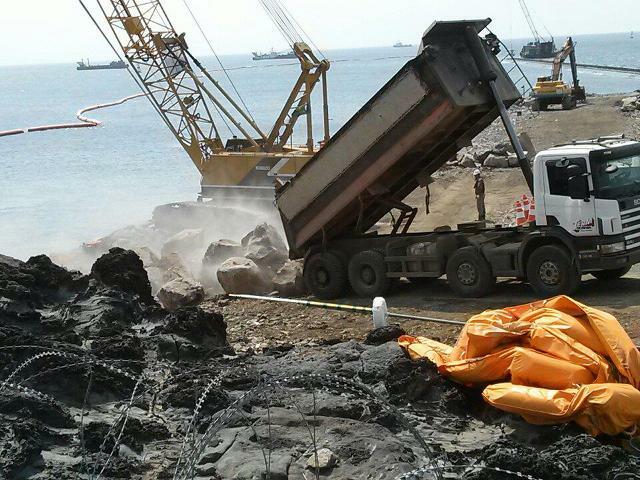 The Jeju Island government was told to have requested the navy to pose construction until the completion of restoration on the silt-protectors but the construction(destruction) noise in the construction area in the night was louder than ever on the very day (April 12) of its request to the navy. 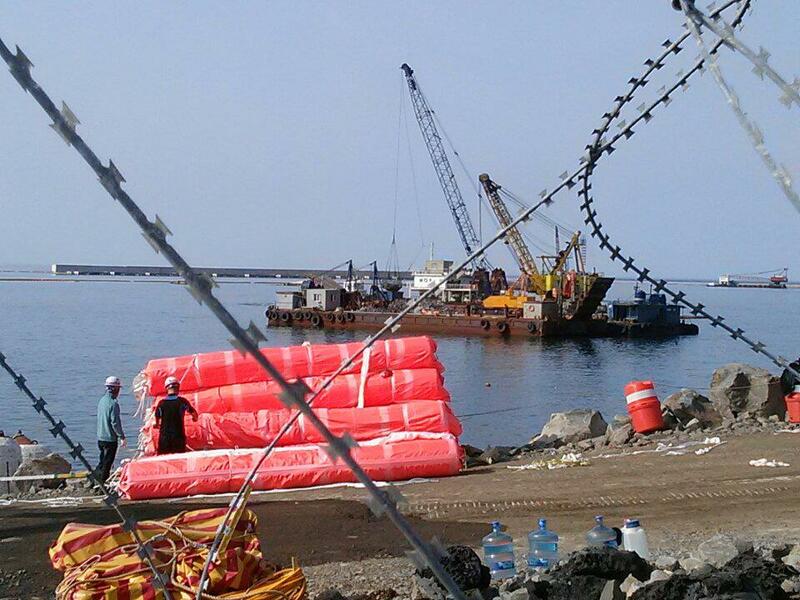 Photo and caption by Park Inchun on April 13/ ‘Even though the Island government made an agreement with the naval base project committee on April 12 that the committee would pose the maritime construction until the repair of silt protectors and investigation on it on Monday, April 15, construction(destruction) has been going on the night of April 12 and next morning of April 13.’ For more photos, see here. 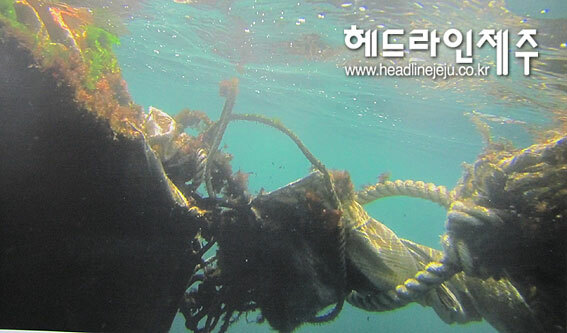 Photo and caption by Park Inchun on April 13/ ‘In the areas of Gangjeong and Ackeun streams, sands are gone and the areas are full of rubbles flown from the construction site. It is told that sweet fishes, hairtails, squids can lay eggs where sands are many.. 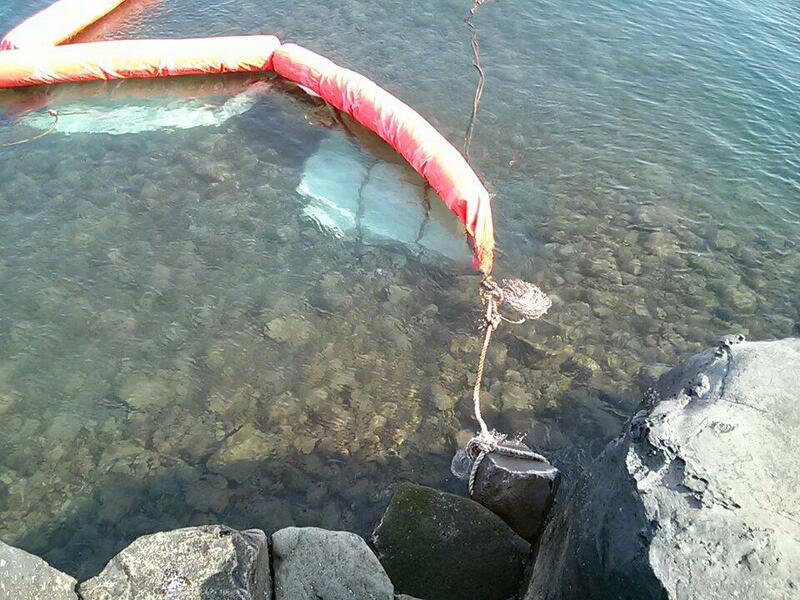 The navy is fitting water depth to the request by the United States[..]’ For more photos, see here. Photo and caption by Cho Sung-Bong/ a tough excavator that breaks rocks underwater. 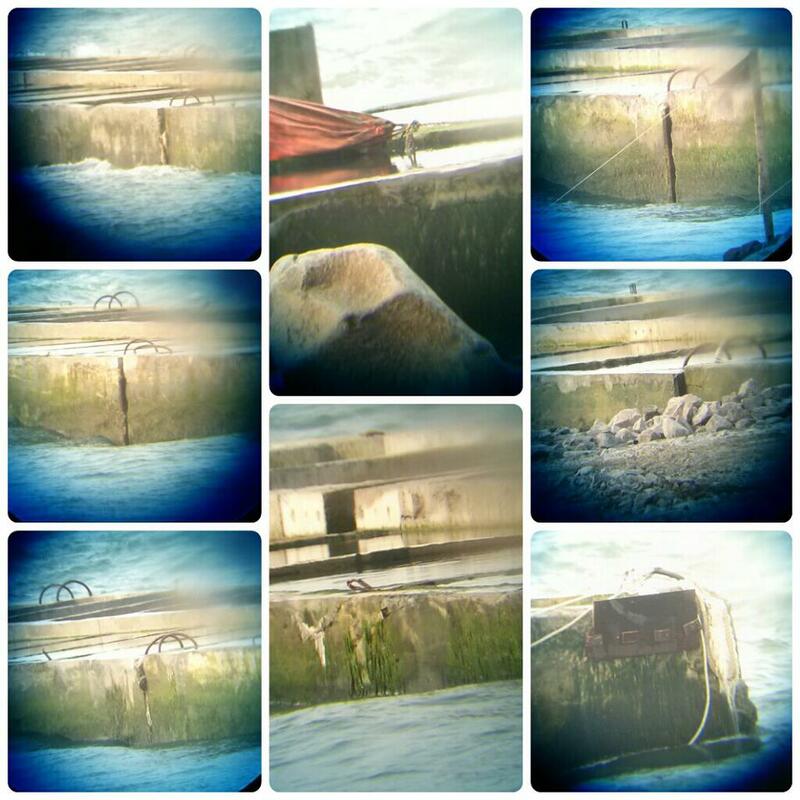 For more photos, see here. 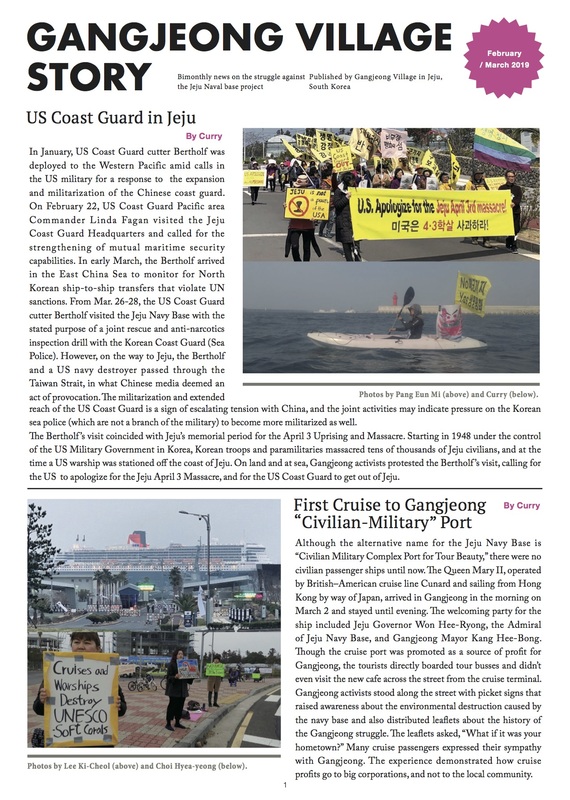 Photo and caption by Cho Sung-Bong on April 14/ The Hankook Ilbo, April 8, 2013, reports.. ‘The work rate in the 1st and 2nd work area in the harbor and bay construction has been 39.3 % and 29.9% respectively [* according to the navy that usually exaggerates]. The construction on land could not even start. The military is concerning about, if the current condition that even construction vehicles cannot properly pass by without the presence of police, the construction on breakwater could be delayed and imminent preparation for typhoon this summer could be difficult.” For more photos, see here.